Arnold Schoenberg (1874 Vienna – 1951 Los Angeles) is best known as a composer, a master of atonal music, and the originator of the groundbreaking twelve-tone technique for musical composition. He was also a teacher and lecturer, theorist, author, and artist. The son of a Vienna tradesman, Schoenberg imbibed the spirit of cultural freedom and invention that surrounded him in turn-of-the-century Vienna and played an important role in the cultural life of the city. Schoenberg was largely self-taught as a composer, and, from a very young age, he learned as much as he could about musical composition. Given violin lessons at the age of eight, he began to compose almost immediately. He left school before his seventeenth birthday to apprentice at the private bank Werner & Co., but continued to compose. He recalled that he was thrilled when an encyclopedia, which his family bought in installments, “reached the long-hoped-for letter ‘S’, enabling me to learn under ‘Sonate’ how a first movement of a string quartet should be constructed.” As a member of the amateur orchestra “Polyhymnia,” Schoenberg had the opportunity to meet Alexander von Zemlinsky, who would become his musical mentor and, later, his brother-in-law (Schoenberg married Zemlinsky’s sister Mathilde in 1901). By the age of 21, Schoenberg had quit his banking job and was serving as a conductor for several small choruses. In 1898, Zemlinsky arranged for Schoenberg’s “String Quartet in D Major” to be performed at the Vienna Musikverein (Vienna Music Association). Schoenberg also began to teach at this time. The year 1898 also marked Schoenberg’s conversion from Judaism to Protestantism (an act that was not uncommon among those who believed that conversion would help them to move ahead in their chosen professions). In 1901, Schoenberg began the first of several extended stays in Berlin, taking the post of music director at the literary cabaret Überbrettl. On the recommendation of German composer Richard Strauss, he was also offered a position teaching harmony at Berlin’s Stern conservatory. After returning to Vienna in 1903, Schoenberg met composer and conductor Gustav Mahler, then music director of the Vienna Hofoper (Court Opera), who also became a mentor. In 1904, Alban Berg and Anton von Webern became his students—they would later be well-known, along with Schoenberg, as composers who moved away from tonality to a new style of atonal music. Schoenberg began to explore painting around 1907, at the same time as the young expressionist painter Richard Gerstl became part of his circle. Gerstl’s work, as well as that of Oskar Kokoschka and Egon Schiele, exemplified the new expressionist painting, which set aside the more stylized work of painters such as Gustav Klimt in order to express emotion more immediately in paint. Gerstl, whose work had an unmatched freedom and expressiveness, made several portraits of Schoenberg and his family, as well as of other friends, including Zemlinsky. The following year, however, an affair between Gerstl and Mathilde Schoenberg was discovered and, not long after, the artist committed suicide at the age of 25. The first exhibition of Schoenberg’s paintings took place at the Heller Gallery in Vienna in 1910. The following year, he met Wassily Kandinsky, who would include Schoenberg’s work in the first exhibition of his and Franz Marc’s expressionist group Der Blaue Reiter (The Blue Rider) at the Thannhauser Gallery in Munich. Although there was interest in Schoenberg’s work, and the work held an important place for him, he did not continue to pursue painting. Schoenberg’s music was also evolving during this period, moving away from tonality and further toward musical expressionism. He described his atonal composition “Pierrot lunaire” (1912) as a “brutally direct expression of sensual and psychical emotions.” Theory of Harmony, his major theoretical work, was published in 1911, with a dedication to Gustav Mahler, who had died that year. In 1912, a group of Schoenberg’s pupils and friends, including Kandinsky and Webern, compiled the anthology Arnold Schönberg in his honor. However, a 1913 concert in Vienna including works by Schoenberg, Berg, Webern, Mahler and Zemlinsky would be remembered for the audience’s vociferous protests. Perhaps as a result of experiences such as this, and with a desire to educate concert-goers, Schoenberg founded the Society for Private Musical Performances in 1918. Society performances were available by subscription only, no applause or other demonstrations of reception were allowed, and critics were refused admission. Unfortunately, the Society only remained active until 1921. In 1923, Schoenberg introduced his ”Method of Composing with Twelve Tones which are Related Only with One Another” and gave it concrete form in his “Serenade, opus 24.” This revolutionary work broke with centuries-old conventions of composition using a system of tonal organization that was a defining characteristic of Western music—it provided a new system for the composition of atonal music. Also in 1923, Schoenberg was invited to become the director of the Weimar Bauhaus music school. He declined the offer because of anti-Semitism at the school. At the same time, he ended his relationship with Kandinsky, a member of the Bauhaus (although the friendship was later renewed). 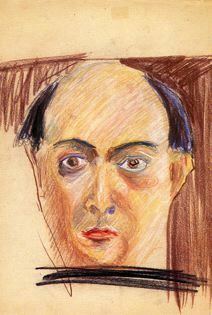 During the 1920s, Schoenberg was becoming progressively more sensitive to anti-Semitism and identifying more with Judaism. However, in 1926, he again went to Germany, to take up the position of director of a master class in composition at the Berlin Arts Academy, despite anti-Semitic protests. That year, he also began work on his opera “Moses und Aron,” exploring Jewish themes. He conceived of the opera as a monumental “Gesamtkunstwerk” (total artwork), and, along with the composition, he detailed stage directions and descriptions of the action. Although he returned to it several times until 1932, “Moses und Aron” remained unfinished. It is, however, his longest twelve-tone composition and considered among the most important modern operas. In 1933, Schoenberg left Berlin for the last time, forced out of his academic post by the Nazis. He reconverted to Judaism and left Europe for the United States. Settling in Los Angeles, he was named a professor at UCLA. Schoenberg continued to compose and see his work performed, in addition to teaching and writing, until his death in 1951. Throughout his career, Schoenberg was greatly admired, especially by fellow musicians, and his music was performed in Vienna, Berlin, and major cities in Europe and the United States. However, as is the case with much revolutionary work, the music was not necessarily well received by the concert-going public, especially during the first half of his career. It was always necessary for Schoenberg to supplement his income through teaching and lecturing engagements, as well as, by arranging the work of other composers. Although this took focus away from his primary work as a composer, Schoenberg also had great influence as a teacher. One of his first pupils in Los Angeles was John Cage, the nascent avant-garde composer. Cage’s groundbreaking work, expanding the possibilities and very definition of music, would, like Schoenberg’s, irrevocably change the musical landscape. Schoenberg, quite literally, bridged the musical generations from Mahler to Cage. His innovation made work like Cage’s possible.